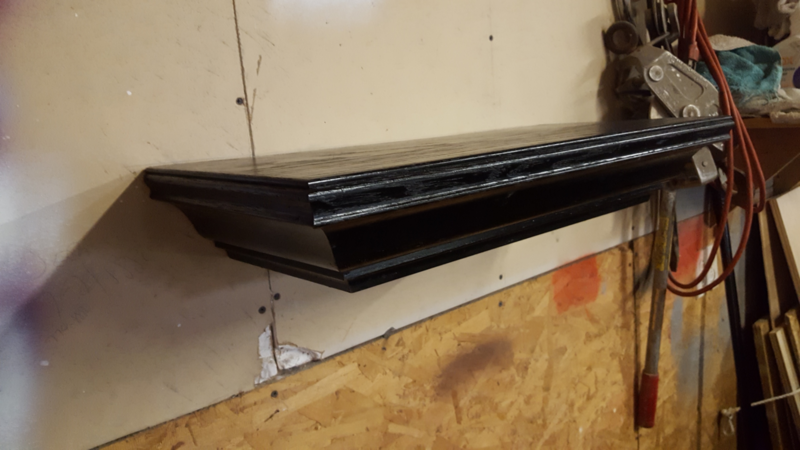 I am building floating/concealment shelves, they're constructed out of oak, measure 4" tall x 24" wide x 12" deep, also building them 10" deep. They are secured using a hidden magnetic lock and come with a magnetic you can attach to the bottom of an item to keep hidden but accessible. 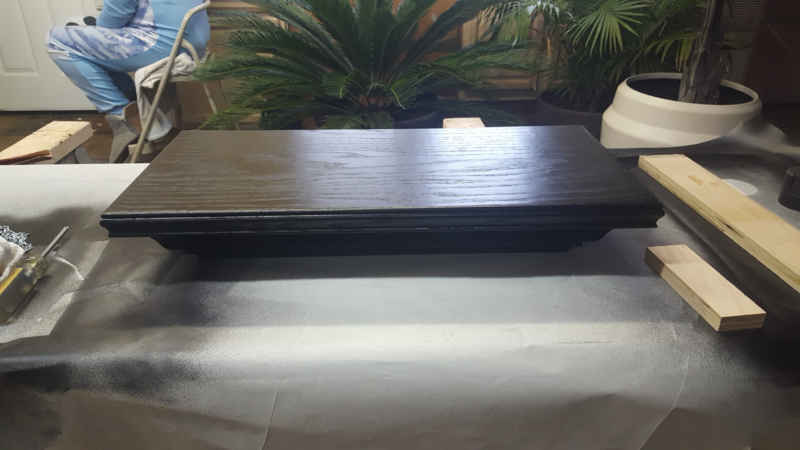 I have a few completed in a satin black finish ( look sharp and the grain really stands out), as well as can stain them any color you might want. The bottom opens at about 45 degrees for access yet not allowing your gun or other items to fall out, the inside storage free area is aprox. 2 1/2 x18"x8". I've seen some others like these for sale but seems like they're made of pine, or particle board. I prefer to sell to people local so not having to deal with shipping and possible damage during shipping and keeping price low. 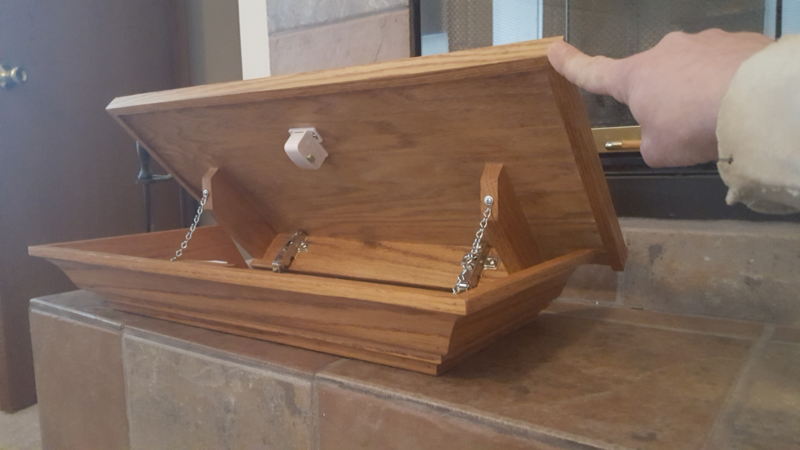 These are not a replacement for a safe but rather gives you a place to store your pistol, cash or jewelry out of sight but readily accessible when needed. Cost is $150.00 each, I can also make custom sizes. I'm located just west of Naperville. Hopeful the photos attached here, but I've had issues with that previously when placing ads selling gins on here. If you're interested please let me know and I can forward photos directly to your e-mail. I've sold a good amount to friends thru Facebook already and everyone is happy with them. Pretty cool, I must say! Beats the price I paid through another place. Shelving designs like this are getting popular. I assume the picture is upside down and that items e.g. 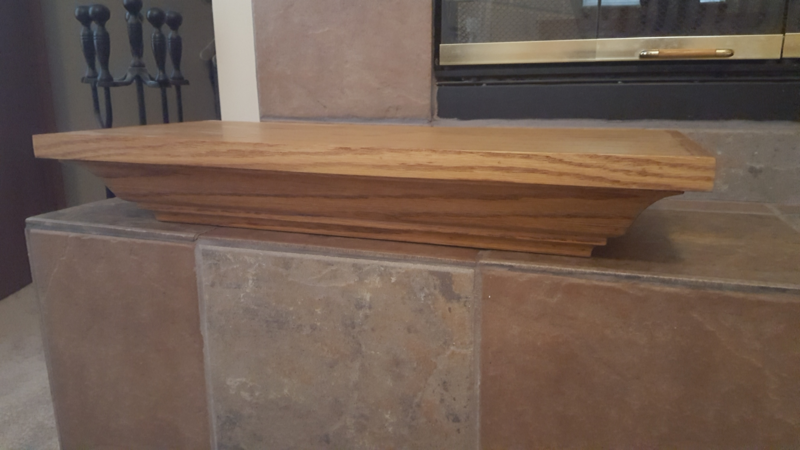 a vase could be placed on top of the shelf. Do you have or can you post a link to any other pictures ? I might be interested but I would obviously want to see more pictures of the finished work. I just ordered one last week. But i got the RFID lock instead of a mag lock. With the 2 kids i felt it was a better option then any magnet opening the lock. But might get one when i have extra funds again to keep other items in. Quiet Observer, yep damn image loaded up side down !! Craig I know what's out there and some of the pricing is a bit goofy and quality not really there. Hatchet, I was thinking about doing the RFID but then gotta worry about battery and I am old fashion I like mechanical things, less problems especially with 2 kids. MIC6010 If you want I can e-mail you additional photos directly as well as a short video. I'm also local so if someone was interested to purchase they can swing out and physically see shelf and really see the quality, I've built a lot of furniture and such over the years and am a trim carpenter by trade and take pride in my work. 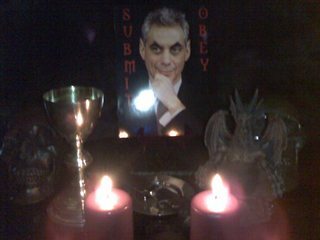 Anyone interested my direct e-mail is jcmattony@aol.com and my phone is 847-417-8575. I'll try to post more photos but the site is a bit hard to get photos to post in general. 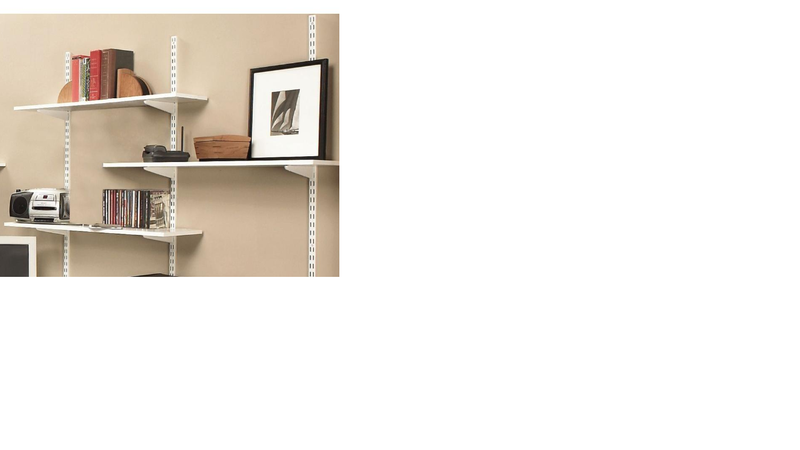 Do these hang on slotted shelf brackets or something nicer that matches the wood? The track system in the photo is what I would be trying to avoid. Edited by TRJ, 04 February 2019 - 03:39 PM. TRJ, no these are a "floating "shelf. You attach directly to wall. I recommend at least 1 screw into a stud and then use 1 or 2 "toggle" type fasteners. I usually use plastic toggles called Pop-Toggle, they hold up to 60 lbs. per anchor and are available at Home Depot. If you want e-mail me for more photos, my e-mail in in this thread. I got some pictures from the builder of these. Maybe these will help prospective buyers. Edited by carry, 04 February 2019 - 08:02 PM. TRJ, thank you help posting photos !! Carry, I was thinking about those but not easy to locate correctly sized down opening strut plus they're not inexpensive to buy and might kill the price point for this item. I'm old school and like mechanical things that can not go bad and wanted immediate access so the chain worked best, actually you're the first to not like the chain. The finish on each is sprayed and nice and smooth !! Very nice looking product. I have to ask what your material cost is because I can't believe you are making much margin on them at $150 each (which is a good thing). Also have you thought about say putting some into LGS on consignment? I have secret compartments built all over in my place with a number of easily accessible weapons in just about every room. I like this concept. Edited by ChicagoRonin70, 21 February 2019 - 09:51 PM. I have a frighteningly good memory. I also regularly check them, do quick-open checks whenever I enter the room and no one is there, to reinforce the information in my mind to habituate myself to doing so unconsciously, so I will react that way under duress. EdScubaDVR, my material costs are about $70- $75 each. no I don't really make much on them considering they take around 4 - 4 1/2 hours each to build and apply finish. I'm a contractor with my trade being trim carpentry, I looked at what was out there, the comments regarding the quality and felt I can offer better quality at an affordable price plus be local so if someone is interested they can put their hands on them and see the quality rather than ordering something on line and being disappointed when it arrives. So I visited Jeff’s house yesterday and bought a shelf. Beautiful, very high quality oak. Will mount it later this week. If you want one, I recommend buying one before he raises the price. $150 is way to cheap for these. Just wanted to let everyone know I'll be out at the Kane County Sportsman Show ( gun show) April 14th. 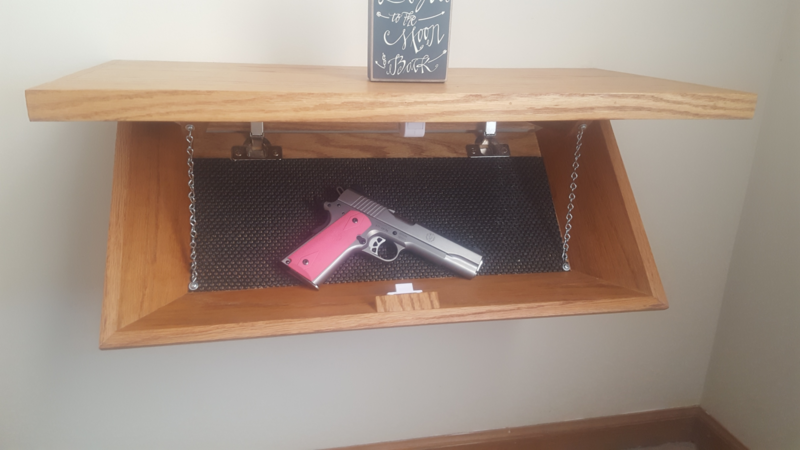 selling the Oak concealment shelves. If you're out there stop by and take a look, I'll bringing about 20 of them out to sell. I've really had a lot of positive feedback and comments from people and feel pretty confident to sell out. As the weather warms up I'm going to take a break from building them and will probably resume back in fall/ winter. Hope to meet some of ya out there !! 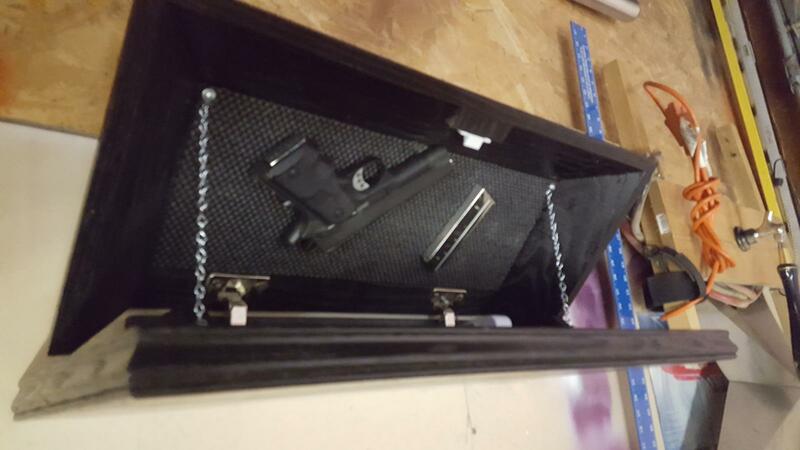 OK guys, I'll be set up at the Kane county sport show tomorrow 4/14 at the Kane county fairgrounds with the concealment shelving. come on out and take a look if you're in the area !! Met Jeff at Kane county sportsman show, those shelves are "GREAT" very well made, look great. Would you happen to be going to the NRA convention in Indy? Edited by ITguy1686, 16 April 2019 - 08:15 AM. No to Indy, I'd rather stay local.